I want to show you a game today that is a mystery in more ways than one. Here is Mystery Number One. This game was played about a month ago. 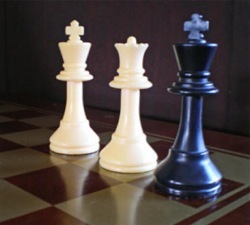 One player is a grandmaster who is very active in American chess. The other player is 17 years old, has a provisional USCF rating and was playing his ninth tournament game ever. Can you tell which is which? I’ll put in diagrams every few moves to help you follow the game. So far it’s a fairly standard Vienna Game/Bishop’s Opening, except that Black has delayed … d6 for reasons known only to him. In the few database games that have reached this position, White usually played 8. Bb3, but White apparently considered rapid development to be more important than pawn structure. I didn’t like White’s 13. Qd2, but I don’t think he has done irreparable damage to his position yet. I think that White is still in the game after 16. Na4. For instance, if 16. … Bxh2+ 17. Kxh2 Qc7 18. Qg5! Nf6 19. Nc3! (It’s more important for White to coordinate his pieces than to worry about the discovered check.) 19. … d5+ 20. e5 Re8 I could see either side winning. I especially like the line 21. cd Rxe5 22. d6!! Qxd6 23. Nf5! and White wins! If 23. … Rxf5+ 24. Rxd6 and the back-rank mate threat decides. Or if 22. … Rxg5 23. dc, it’s very hard for Black to stop the passed pawn. But for some strange reason, White gives up a piece with 16. Bxe5?? What could he have been thinking? The game continued 16. … de 17. Na4 Qxd4+ 18. Qxd4 ed 19. Rxd4 Be6 20. Rad1 Nf6 21. e5 Ne8 22. Nc5 b6! This is about the best White’s position has gotten since he blundered/sacrificed the piece. Maybe he was planning to play 23. Nxe6 fe 24. Rd7, but it’s nowhere near good enough after 24. … Rf7 25. Rxf7 Kxf7 26. Rd7+ Kf8. White has a good temporary bind, but Black is eventually going to wriggle out of it, sacrificing one of the queenside pawns if he has to. In any event, White changed his mind but now the pressure on Black eases. And now something truly unbelievable happened. But before I tell you what happened next, let me get back to that question I asked you. Who is the grandmaster, and who is the teenager who has played only eight rated games in his entire life? The correct answer: White is the grandmaster, and Black is the teenager! That’s right, it’s the grandmaster who accepted the isolated pawn on e4, created all those dark-square weaknesses, and finally, unaccountably, sacrificed/blundered his knight on d4, a blunder so obvious that any club player would see it. His name is Nikola Mitkov, a player with a FIDE rating of 2527. He was the highest-rated player at the Chicago Class Championship, where this game was played in the first round, and in fact he eventually tied for first place in the tournament with a score of 4-1. As for Mystery Player 2, his name is Alex Ding. He subscribed to chess.com about a year ago, heard about USCF tournaments, thought they sounded like fun, and entered one. At his first tournament he earned a provisional rating of 2286 (4 games). After his second tournament he went down 100 points. At the Chicago tournament he went 2-3 against five masters (including this game), a not-too-bad result that kept his rating at 2178. He gives some light annotation of this game at his chess.com webpage (which is where I got this game from). I can’t even begin to imagine the emotions that were going on. Here you are on BOARD ONE of a big tournament, playing a GRANDMASTER in the ninth game of your entire chess career, and you’re WINNING. And then you touch the bishop! Why, in this position, would you even dream of touching the bishop? I can’t fathom any reason why Black, with two pieces en prise, would touch a third one. Unless he did it by accident. But if it was truly an accident, then certainly the gentlemanly thing for a grandmaster to do against a kid would be to acknowledge it was an accident and let him play the move he intended to play. I admit I’ve won a couple games in my life on the touch-move rule. One was even in a position where I probably would have lost otherwise. 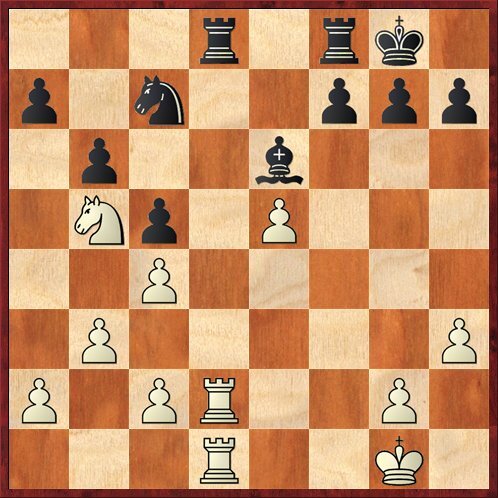 But in both cases, it was very clear that my opponent intended to move the piece, picked it up, and then saw what was wrong with the move. In this position, I can’t imagine how Ding could have picked up the bishop with intent to move it. So that’s the real mystery of this game, to me (on top of the other mysteries like how a GM could play so badly). Did Ding really intend to move the piece? Or did the GM win because of an inadvertent touch? Anyway, I hope that Ding will get another chance sometime to beat a GM, but I’m warning him: It’s hard. I’ve been playing tournament chess for 39 years and who knows how many hundred games, and I have never come close to beating a grandmaster. A small correction: One chess.com subscriber commented on Ding’s page that White could still have saved the game after 16. Bxe5 de by playing 17. Qg5! The point is that after 17. … ed 18. Na4 Black has to move his queen, and then the h5 knight falls. So actually, 16. Bxe5 is not the blunder, 17. Na4?? is. But the whole thing is still incredibly perplexing to me. Why would a grandmaster play 16. Bxe5, apparently giving away a knight for no reason, if he didn’t see the saving move 17. Qg5? On the info we have, I agree that the most likely explanation for what happened is that Black was unaware that the touch-move rule only applies when one touches with the intention of moving. (As to the GM’s possibly allowing his opponent to incorrectly bind himself to making a losing move, it would not surprise me in the least, partly because of what i know about myself–especially back when winning meant a lot to me–and partly because of what i know about other chessplayers, very much including GMs.) Iinteresting tale, appreciated the diagrams. Hey, I haven’t been on chess.com in awhile, and only recently saw your post. This is what actually happened (sorry for not explaining in depth before, I was quite tired when I finished posting it). 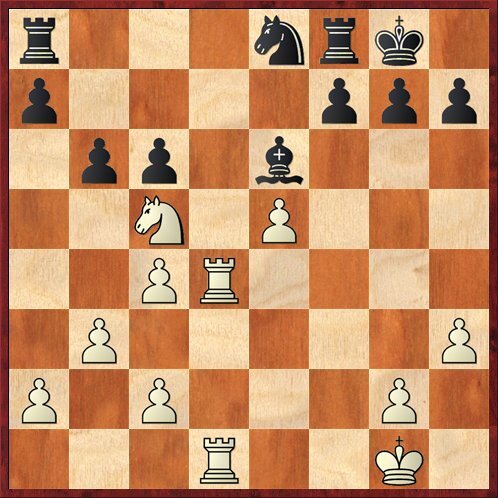 Basically in the position before Bxh3 was played, his h3 pawn was…askew. I have this annoying habit of always adjusting my own (and my opponent’s) pieces so that they are centered. I didn’t touch my bishop, i touched my opponent’s h3 pawn. 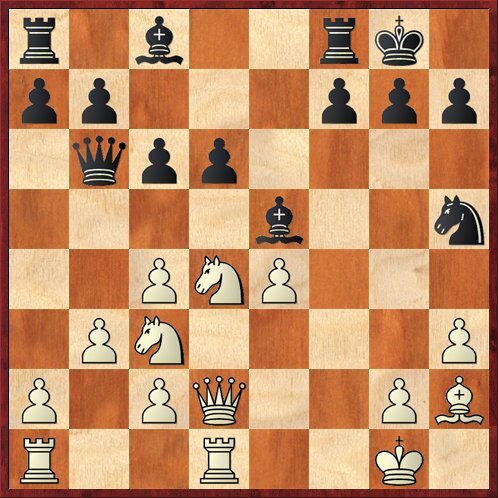 Unfortunately, I did not say adjust, but I thought it was pretty clear that I didn’t intend to take the pawn on h3 when I have a piece hanging on d8. My opponent actually did not call the touch move rule immediately, but after approximately 3 seconds or so, he probably realized his “saving resource” and called touch move. I thought this was preposterous, and called over an arbiter. The arbiter then asked a few people around if they saw anything and no one said they did. So basically it went down to the GM’s word over mine. I told the arbiter that even though this was only my third tournament, I’m not stupid enough to want to take that h3 pawn. 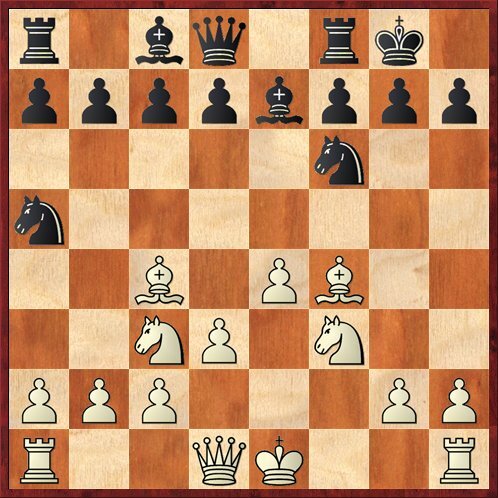 The ruling was basically this: Since I touched the h3 pawn without announcing my intention of adjusting it, I would have to capture that pawn. I pretty much just resigned on the spot in disgust. I could have played on with 27. Rxd8 Nxb5 28. cxb5 Bf5, or maybe 28. gxh3 Nd4 (but 29. Rd7 looks crushing). So, yeah, playing on was an option, but needless to say, I was PISSED. This probably affected my later games that day (I lost they next two), but life moves on. It was actually later in the tournament when i heard of the “intent to move” part of the touch move rule. I was telling this tragedy/comedy to my last opponent and he said told me about the rule. When i approached the TD, it was already too late to contest the arbiter’s ruling. I didn’t know about this blog before, but I greatly enjoyed reading your other articles! I will definitely check back here every now and then to see what’s new! Thanks for writing in and satisfying my burning curiosity! I think that Mitkov’s actions were disgraceful. The arbiter should also have applied some common sense; I suspect he was intimidated by the fact that Mitkov was a GM and the highest-rated player at the tournament. But finally, this really shows the importance of knowing the rulebook, because if you had known that an inadvertent touch does not compel you to move or capture the piece, I think that you would have had a really good chance of getting this ruling overturned. I hope you will not let this awful display of poor sportsmanship and poor refereeing discourage you. Please keep playing tournament chess. Anybody who beats (or should have beaten) a GM in their third rated tournament should definitely keep playing!